These steps applies only to ASP.NET MVC version, not ASP.NET Core version. Keep reading to see how to run Sergen in ASP.NET Core version. After making sure that our table exists in the database, we will use Serenity Code Generator (sergen.exe) to generate initial editing interface. In Visual Studio, open Package Manager Console by clicking View => Other Windows => Package Manager Console. Type sergen and press Enter. Sometimes NuGet package manager can&apos;t set PATH correctly and you may get an error like below while trying to execute Sergen. Unfortunately, this is a bug of Visual Studio / NuGet and is not related to Serenity or Sergen itself. Most of the times, restarting Visual Studio might resolve the issue. If it doesn&apos;t, you may open Sergen.exe from Windows Explorer. Right click on MovieTutorial solution in Solution Explorer, click Open In File Explorer. Sergen.exe is under packages\Serenity.CodeGenerator.X.Y.Z\tools directory. If you change this value and other options, and generate your first page, you won&apos;t have to set them again. All these options will be saved in Serenity.CodeGenerator.config in your solution directory. This value is required, as Sergen will automatically include generated files to your WEB project. Script project field should be empty for v2.1+. This is for users of older Serene, who might still have code that was written with Saltaralle compiler, instead of TypeScript. Your root namespace option is set to the Solution name you used, e.g. MovieTutorial. If your project name is MyProject.Web, your root namespace is MyProject by default. This is critical so make sure you don&apos;t set it to anything different, as by default, Serene template expects all generated code to be under this root namespace. It is also very important to understand that Root Namespace is case sensitive and must exactly match your project name, e.g. not movietutorial or movieTutorial but MovieTutorial. This option is also saved, so next time you won&apos;t have to fill it in. Once you set Web project name, Sergen populates connection dropdown with connection strings from your web.config file. We might have Default and Northwind in there. Choose Default one. Sergen can generate code for multiple tables, but we&apos;ll generate for only one now. Once we choose connection string, table grid is populated with table names from that database. Mark checkbox next to Movie table. This usually corresponds to the table name but sometimes table names might have underscores or other invalid characters, so you decide what to name your entity in generated code (a valid identifier name). Our table name is Movie so it is also a valid and fine C# identifier, so let&apos;s leave Movie as the entity identifier. Our entity class will be named MovieRow. This name is also used in other class names. For example our page controller will be named MovieController. It also determines the page url, in this sample our editing page will be at URL /MovieDB/Movie. Identifier must always be in Pascal case, e.g. something that starts with a CAPITAL letter. myTable, mycoolTable, aTable are invalid module names. MyCoolTable is OK.
We&apos;ll add a validation to Sergen for this soon. In Serenity terms, a module is a logical group of pages, sharing a common purpose. For example, in Serene template, all pages related to Northwind sample belongs to Northwind module. Pages that are related to general management of site, like users, roles etc. belongs to Administration module. A module usually corresponds to a database schema, or a single database but there is nothing that prevents you from using multiple modules in a single database / schema, or the opposite, multiple databases in one module. For this tutorial, we will use MovieDB (analogous to IMDB) for all pages. 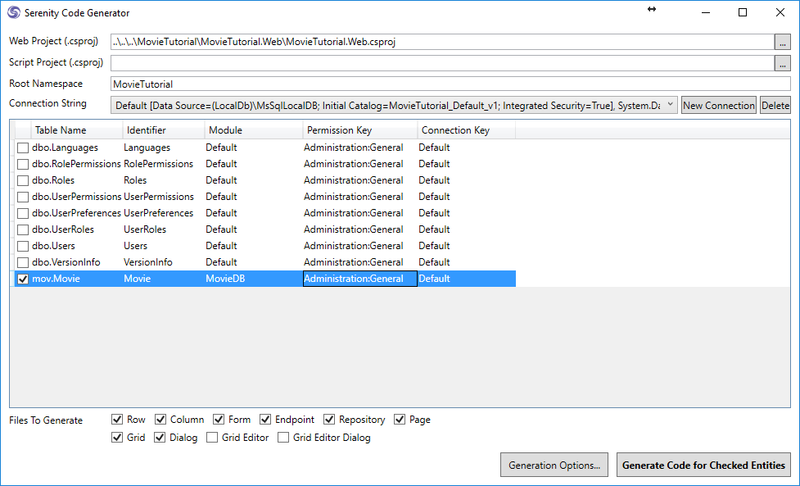 Module name is used in determining namespace and url of generated pages. 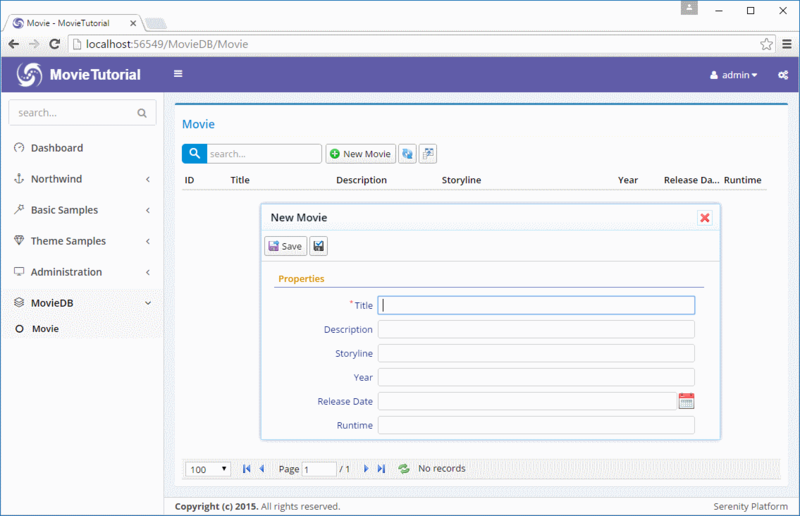 For example, our new page will be under MovieTutorial.MovieDB namespace and will use /MovieDB relative url. Module names must also be in Pascal case, e.g. something that starts with a CAPITAL letter. myModule, mycoolmodule, aModule are invalid module names. MyCoolModule is fine. In Serenity, access control to resources (pages, services etc.) are controlled by permission keys which are simple strings. Users or roles are granted these permissions. Our Movie page will be only used by administrative users (or maybe later content moderators) so let&apos;s leave it as Administration:General for now. By default, in Serene template, only the admin user has this permission. Connection key is set to the connection key of selected connection string in web.config file. You usually don&apos;t have to change it, just leave default. After setting parameters as shown in the image above (you only have to set Module Name, others were prefilled), click Generate Code for Entity button. Sergen will generate several files and include them in MovieTutorial.Web and MovieTutorial.Script projects. Now you can close Sergen, and return to Visual Studio. These steps applies only to ASP.NET Core version, not ASP.NET MVC version. As ASP.NET Core has cross-platform support, .NET Core version of Sergen also needs to run in OSX / Linux / Windows. Thus, its UI is currently console based. We first need to open a command prompt at project folder. Right click MovieTutorial.Web project and click Open Folder in File Explorer. Click File menu in file explorer, and click Open Windows Powershell or Open Command Prompt. 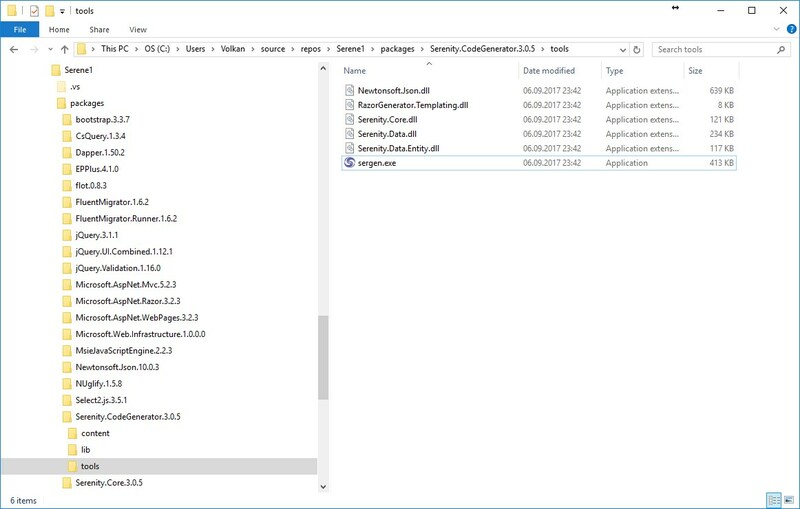 You may also install this extension (https://marketplace.visualstudio.com/items?itemName=MadsKristensen.OpenCommandLine) to easily open a command line next time. I can&apos;t understand why there is still not such an option in Visual Studio itself. Make sure you are at MovieTutorial.Web directory. Type dotnet sergen g to open Sergen code generation UI (console). If you receive an error, type dotnet restore before running sergen. Sergen will list connections in appsettings.json file. You can use TAB completion, e.g. type D and press TAB to complete Default. Clear dbo. using backspace, and type mov.Movie or type m and use TAB completion to select mov.Movie, then press ENTER. Next, Sergen will ask for a module name, enter MovieDB. When prompted, enter Movie as identifier. Leave permission as Administration:General and press enter again. Sergen will ask you which files to generate, leave default RSU option (e.g. Row, Service and User Interface) and press ENTER last time. As project is modified, Visual Studio may ask if you want to reload changes, click Reload All. REBUILD the Solution and then press F5 to launch application. Use admin as username, and serenity as password to login. When you are greeted with Dashboard page, you will notice that there is a new section, MovieDB on the bottom of left navigation. Click to expand it and click Movie to open our first generated page. Now try adding a new movie, than try updating and deleting it. Sergen generated code for our table, and it just works without writing a single line of code. This doesn&apos;t mean i don&apos;t like writing code. In contrast, i love it. Actually i&apos;m not a fan of most designers and code generators. The code they produce is usually unmanagable mess. Sergen just helped us here for initial setup which is required for layered architecture and platform standards. We would have to create about 10 files for entity, repository, page, endpoint, grid, form etc. Also we needed to do some setup in a few other places. Even if we did copy paste and replace code from some other page, it would be error prone and take about 5-10 mins. The code files Sergen generates has minimum code with the absolute basics. This is thanks to the base classes in Serenity that handles the most logic. Once we generate code for some table, we&apos;ll probably never use Sergen again (for this table), and modify this generated code to our needs. We&apos;ll see how.